Q1 What do you think are the biggest benefits of teaching and using traditional woodland management techniques in city parks? A1. The essence of a Ranger’s role is to engage the community at large with the aim of encouraging more people to use parks and green spaces. Therefore a range of themes, topics and activities are employed to meet the broad interests and diverse nature of the public, involving people of all ages, abilities, ethnicities etc. The ‘woodland’ theme seems to have universal appeal and is steeped in history, ecology, science, spirituality, mythology and culturally, much more. Wildlife connections - "Modern life is such that it can be hard to see beyond the present"
Rob Cowan's early words in 'Common Ground' resonate with many of us as we struggle to come to terms with 'life's meaning'. We are provoked to read on in search of 'the way' forward, an answer maybe or a coping mechanism; 'Common Ground' encourages us to observe the detail around us and to connect with our local green space. 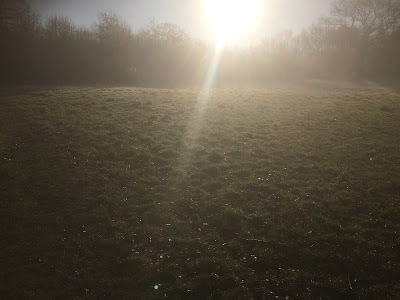 10.00am January sunburst across the meadow at Cannon Hill. Deep midwinter and mid morning beams stirring the undergrowth. Here I briefly sunbathed with a squirrel as a male Sparrowhawk glides through in hunting mode. The crows stir. Perhaps it's a youngster as little else seems concerned. Brockley Grove was once a garden area, between the 1940's and 70's, now it is overgrown and lush, providing good and largely undisturbed cover. Badgers abound and the sett is prominent. Here we hear and see bullfinches abundant together with a variety of other woodland species. 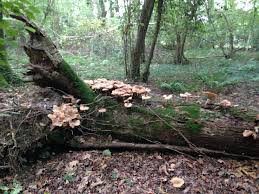 "the TCV Citizen Science team have been working to produce The Dead Good Deadwood Survey!" 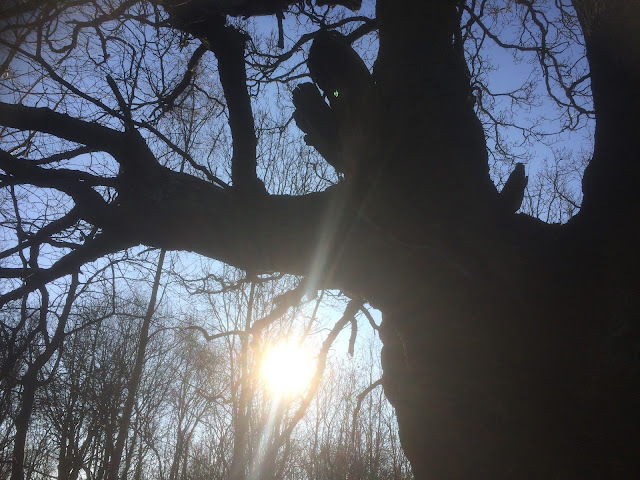 Over the next few weeks until mid March there will be opportunities to engage with like minded volunteers, interact with nature and contribute to the management of both woodland and grassland, as well as exercising mind and body during Woodland Wednesdays at Highbury Park. 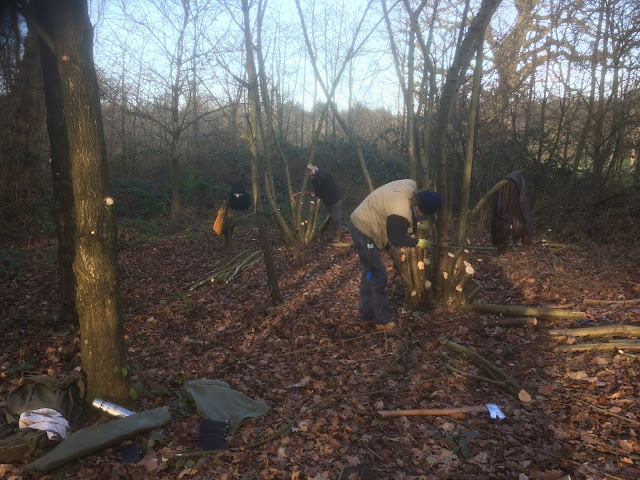 Today we continued coppicing, mostly hazel, and opening up the woodland canopy to allow much needed light to reach the lower levels; our efforts are designed to diversify the woodland plantation, adding layers with new regenerating growth in spring and added wildflowers thanks to Eco Park and NIA. A rather worrying observation led to a discussion regarding the level of bark stripping on 25 year old oaks. 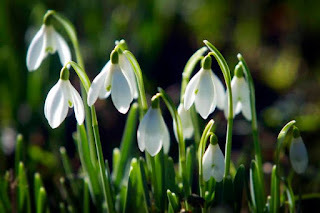 Signs of spring are upon us, hoorah, at least, if not spring, as it's clearly mid winter, we have signs of rebirth, new beginnings, new life, natural occurrings etc. https://www.woodlandtrust.org.uk/visiting-woods/natures-calendar/what-is-phenology/ In the midst of winter with arctic conditions forecast and many species yearning the warmer months ahead, we might gain meagre solace, desiring the coming spring, as we witness plants, such as Winter Flowering Cherry, other Prunus species, snowdrops and camelia, to name a few, already in flower. Over the next few weeks we can expect many changes in the wild, providing us with hopeful signs, positive thoughts and optimism for the year ahead.